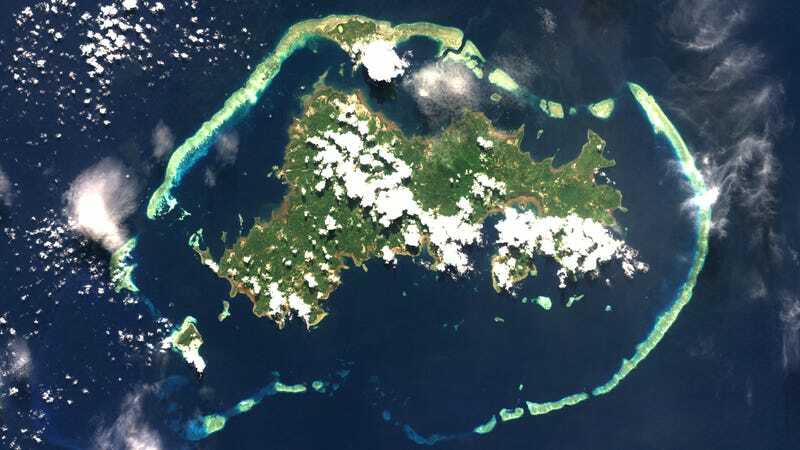 Satellite view of the island of Mayotte in the Indian Ocean. Between Mozambique and Madagascar lies the island of Mayotte. Since May 10, the French Geological Survey has been keeping an eye on a collection of earthquakes taking place just off the island’s eastern shores, which peaked with a magnitude 5.8 shake. This swarm was curious enough all by itself—and then, on November 11, things took a peculiar turn. That day, seismographs all over the world registered a very low-frequency tremor, a strange grumble that lasted for around 30 minutes. One segment of the signal also featured several high-frequency blips, each separated by roughly a minute of time, a bit like a regular, ticking clock. Stephen Hicks, a seismologist at the University of Southampton, highlighted the phenomenon in a November 12 tweet. “Something biggggg, yet strangely slow, sent seismic rumblings around the surface of much of the planet yesterday,” he wrote. Today, that succinct summary still holds, even as discussion of the event continues between geoscientists of all kinds over on Twitter. To date, no one is quite sure what caused it. It wasn’t a tectonic earthquake, a landslide, nor a meteorite impact. Some experts baffled by the seismic enigma have not-so-seriously suggested that perhaps, finally, it’s sea monsters. The strange sound was almost certainly not Godzilla taking a submarine stroll, but scientists are starting to coalesce around what they suspect may be the answer: strange and unseen movements of magma, far beneath the seafloor. In order to understand why, though, we have to go back to the very beginning. Robin Lacassin, a geologist at the Paris Institute of Earth Physics, told Gizmodo that Mayotte is part of the Comoros archipelago, a chain of volcanic islands that first saw fireworks 20 million years ago. Eruptions have flared up in recent times on other islands, most notably Grande Comore. Conversely, Mayotte, a comparatively dormant presence, hasn’t seen any fresh lava for around 4,000 years. In any case, volcanism in the region—powered by a small rising mantle plume or a deformed tectonic plate—is alive and kicking. The swarm of earthquakes taking place near Mayotte, although new for the area, resemble those produced by magmatic processes of some kind, including the movement of magma and other superheated fluids. The November 11 signal, however, is a very different kettle of fish. No specific natural process has yet been linked to the seismic data, and the lack of monitoring at the site of the event means even its precise location is currently unclear. First, let’s look at that low-frequency hum. Representing surface waves traveling across the planet, this dominated the global signal. High-frequency waves were not picked up by distant stations. Hicks told Gizmodo that a good analogy here is someone living down the road from a nightclub. You might not be next door, but as long as the energy behind the beats is high enough, “what you’ll hear is the bass, not the higher-pitched stuff,” which weakens relatively quickly. Potent bass lines can be created by many slow, powerful events, from tectonic earthquakes to submarine landslides and even glacial calvings. In this case, the tide gauges failed to show any changes during the event, meaning there were no mass movements on the seafloor of any kind. The few GPS stations in the region recorded some local seafloor movement, but just a little, suggesting the signal’s source was fairly deep. Although a submarine eruption cannot be ruled out, there are as yet no observable signs that one took place, like fresh lava on the seafloor or a floating raft of pumice at the surface. Instead, Lacassin said that all the data points to the movement of magma within the crust. But where exactly was it going? A day after the event, researchers at the ENS University in Paris suspected magma was draining from the site, causing the roof of a reservoir of magma to collapse and cause quakes. In a statement, they reckoned that 0.3 cubic miles of magma draining from a reservoir would fit the GPS data well. A good comparison here, according to Lomax, is what was seen recently at Kilauea in Hawaii. During that eruption, magma continuously drained from the summit crater. The crater deflated, causing earthquakes, and magma escaped underground to the volcano’s eastern flanks. At the time of writing, Hicks’ analysis is leaning toward drainage again. Either way, it’s got to be moving magma, but nothing’s certain yet. The deficit of instruments near the signal site means “there are no real before-and-after datasets,” Helen Robinson, a geothermal expert and PhD candidate at Glasgow University, told Gizmodo. Useful information as to what physically changed at that spot near Mayotte doesn’t really exist. The key piece of evidence here is the seismic signal, which certainly shows the ghost of something strange. The signal is so utterly weird, though, that it’s proving difficult to decipher. Ampuero said he spoke to a colleague of his whose expertise is in the seismology of volcanoes. They confirmed that the internal chaos of volcanoes can cause very low-frequency hums, but the incredibly long 30-minute duration of this one was currently inexplicable. Then, there are those clockwork-like high-frequency blips, which revealed themselves after seismologists began filtering out the signal’s deep hum. Robinson explained that such blips are like those detected when rock is being fractured as magma forces its way through. “What baffles me is how evenly spaced out they were,” she said. “I have no idea how to explain that.” Neither, as it turns out, can anyone else. Here, the high-frequency blips instinctively brought industrial or military activity to Robinson’s mind, but there is no sign of anything of the sort in the region. In this case, the regularity could perhaps be magma moving at a constant rate through the rock, causing repeating fractures. Like much about the signal, this interpretation is far from certain. Lomax brings up the parable of the Blind Men and the Elephant, which tells the tale of said men encountering an elephant for the first time, with each trying to identify what it is by touching just one part of it. Similarly, researchers of different geoscience stripes are giving their own interpretation of the curious signal. “That’s a good start, because you want different takes from different directions,” Lomax said. Cracking the case, however, is a team effort. Fortunately, judging by the frenetic scientific discussion still taking place on social media, that’s already in full swing.